Couldn't Nikon make a better camera phone than Apple? If smartphones are the new compacts why don't camera brands make them too? Broadly speaking there are two types of people in this world - those who make things happen, and those who have things happen to them. Although it may not always be easy, we can choose which of those we are going to be, and more often than we realise. Will we be self-determining and take responsibility for our own life, or will we allow ourselves to suffer the consequences of others' actions? We each make that choice, consciously or not, every day. The situation is not lost though, surely, and if we can now accept that smartphones are the new compact camera, the likes of Canon and Nikon could stop licking their wounds and get designing a smartphone themselves. How hard can it be? Even a regular phone with a Nikon lens and Nikon DSLR-inspired functionality would surely go down a storm. I'm not entirely sure how important the telephony functions of such a device would be, and how much better at making calls one of the current phones is compared to the others – smartphones are never advertised as great telephones. Ironically, it seems that the phone function of modern phones is the last thing anyone is interested in – so long as it works. 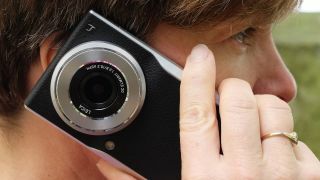 Perhaps Nikon, Canon, Pentax, Olympus or Fuji – or any of the big players in the previously high-volume compact camera market – could follow Panasonic's lead by producing a slim, high quality camera with smartphone functions? So long as it were combined with the unique imaging expertise they have all acquired over the years and their own optically superior lenses, they could certainly come up with a device lots of us would want to own. As has been shown by the drooling media coverage of the Panasonic Lumix DMC-CM1, the combination of high-end Lumix camera functions, a Leica lens and contemporary smartphone features makes a very heady mix indeed. If the head of Nikon/Canon/Olympus/Pentax is sat at home with a bottle of whiskey and sobbing into a hanky it is only because they haven't done anything to challenge Apple, Samsung, HTC and Nokia while they strolled around their house helping themselves. Although these monster brands seem now to have the market sewn-up, I don't believe it is too late for proper camera companies to take at least some of it back with a camera phone that stands out. No-one wants the cheap end of the mass market where there is no money to be made, but there is profit, prestige, future-proofing and self-respect to be had creating beautiful devices that take fantastic pictures that people who care will want to buy. So, get on and do it.